Tamsyn Challenger broadly concerns herself with the steady march of time upon the body; on her own, on those whom she loves, male and female, and on the desperate ravages inflicted on a woman's form by the warping of beauty into an ideology, where the natural becomes perverse. As a documentarian she has borne witness to gender violence and the subsequent lives no longer in extant. Inevitably, this colours a palette and in previous work she has used organs and teeth as a visceral reminder of mortality. However, the Tamsynettes represent a piecing together of beauty. 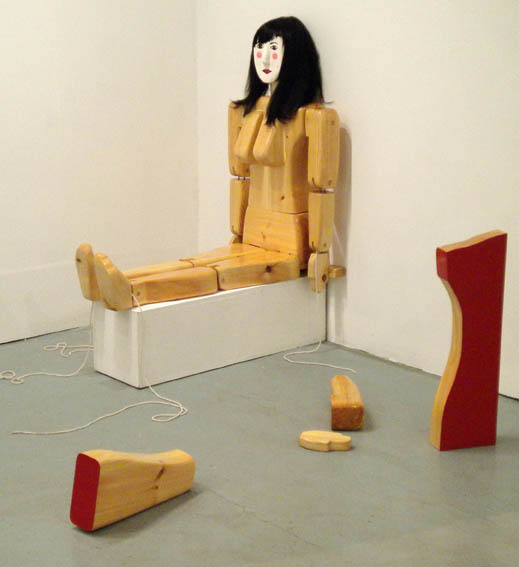 By utilising her abilities in craft practice, the handmade polished and painted wood and cloth figures that have been taken from her own measurements and matched to the colour of her blood are simultaneously deconstructing femininity whilst being beautifully constructed self- portraits. 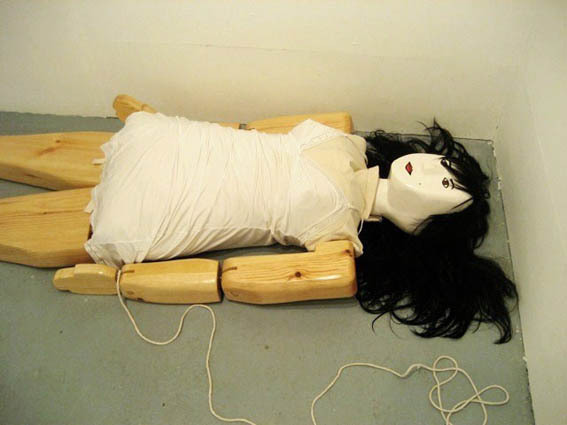 Conceptually led, her work toys with the forces of modern popular culture as blind-siding. The nipping and tucking of whatever is at hand to under-pin an image and the passivity of watching to create identity often moves Challenger to reunite fairytale such as The Snow Queen and Snow White with their gruesome roots. Living up to her name Challenger wants to challenge the viewer to resist the all pervading post-modern ethic whilst by her own admission being the most post-modern woman she knows. In Spring 2010 at Transition Challenger will introduce The Tamsynettes. Forever versions of herself for you to play with. There is a limited edition print of Tamsynette Lilo available click here for more info. Tamsyn Challenger trained at Winchester School of Art and KIAD. 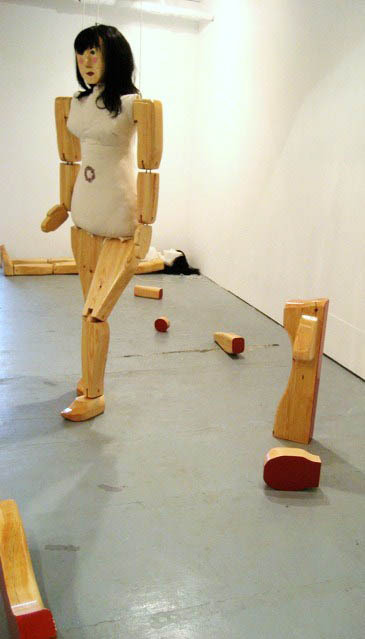 She has worked as a collaborative artist with the Magdalena Festival in Barcelona and with Triangle theatre. Her work has been exhibited in the Truman Brewery and Candid Arts in London. She has also produced documentary work for the BBC, 'My Male Muse' receiving Radio 4's 'Pick of the Year' accolade. For the past five years she has undertaken a conceptual installation based in portraiture that comes to fruition in November 2010 in Shoreditch Town Hall. This work includes collaborating with over 150 different artists and is a project she conceived of in Mexico that focuses on the murdered women of Juarez.